When people think of a “Success Story”, they always think of those who have worked for quite a while and climbed the corporate ladder quickly and brilliantly. 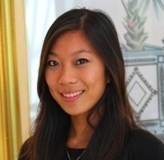 But when you listen to Jenna Li, the Dubai Ritz-Carlton Meetings & Special Events Executive, as she tells us her story, it’s really hard to imagine that she has just graduated from Vatel in Mauritius. So here is our youngest 2013 Success Story told by a 2013 graduate! VATELIEN APPOINTED : Jenna was promoted Starwood Hotels & Resorts WorldwideComplex Catering Sales Manager in August 2015. Jenna, could you tell us why you decided to study at Vatel? I was born and raised in Mauritius. I was lucky to be able to attend the best girl’s high schools on the island: Lorrette College in Port Louis and Queen Elizabeth College. All courses were given in English and my high school education followed principles of the Cambridge Higher School Certificate. As I had very good grades, I was able to be nationally ranked. And that opened many doors for me when choosing what I wanted to study. I had always known that I wanted to work in the tourism and international hospitality industry. So I started to look at what was offered in that field throughout the world and I discovered Vatel. And when digging a little deeper, I saw that a Vatel School had just opened in Mauritius. That was a golden opportunity I couldn’t pass up! Hotels in Mauritius are renowned throughout the world as being some of the most luxurious ones that exist and having a school with a global reputation right on my doorstep made this an obvious choice for me. In addition to that, I didn’t want to go to a school that only gave theoretical courses. So Vatel’s method of education with a mixture of practical courses and lectures was just what I was looking for. Having the possibility of putting into practice what was studied every two weeks is really an asset that puts Vatel in a class way above other schools specialized in hotel and tourism management. So you would say that Vatel lived up to your expectations? Exactly, and even exceeded them! In Vatel I discovered how strong team spirit and solidarity were. There weren’t many students in my class so we were all very close. We worked on a lot of projects together. I particular I remember all the pre and post production needed for our first Lipdub in our Schools and organizing the first Vatel seminar in Mauritius. Being a part of these two events allowed me to realize I wanted to work in Special Events Management. Another thing that really struck me was that most of our professors came in just for us from foreign countries to give their courses. The expertise and wealth of content in their courses was fantastic. I remember each and every one of them and continue to thank them for what they taught me. Where did you do your practical application work and internships? At Four Points by Sheraton Cybercity, the Royal Palm Hotel, and at the St. Regis Resort in Mauritius. And for my first internship it was at the One&Only The Palm in Dubai. Not bad! Discovering a lifestyle that was completely different from mine in my first internship really helped me to gain maturity. Each experience and each professional person I met during the three years I spent at Vatel in Mauritius really impacted me in my professional life. I remember each event I worked on during my internships as well as the tasks I accomplished during my practical application weeks. Spending this time in hotels really changed me. It made me a better person. And that’s how your final internship turned into your first job? Is that correct? That’s it exactly! I finished my exams at the end of October 2012 and then a few days later I took the plane to Dubai and started my final internship in the Ritz-Carlton. Three months later, they hired me in the job I’m currently employed. I think that this is pretty good for a first job. Can you tell us in detail what you do then? My job consists of directly reporting to the Events Manager as well as the Sales & Marketing Manager. This job gives me a lot of responsibilities at the hotel. Staying within a given annual and monthly budget, I take care of all private events such as meetings, conventions, weddings (what I prefer!) that I organize from A to Z as the direct interface between the hotel and the customer. I’m also in charge of the entire sales process that consists of attracting the largest amount of visitors into our hotel so we can show off our many assets: having them visit the hotel, showing them the new rooms and restaurant, etc. My “sales intensity” must always be at its peak and I’m there during each event. Would you like to add anything? Vatel opened every single door for me. It’s true that all students must involve themselves completely and never hesitate to go the extra mile, be patient and passionate while attending school. But Vatel values and its curriculum really help people distinguish a Vatelien from all the others. I would like to encourage as many young people as possible to choose to attend Vatel, and to get as much experience as possible. I’d like to thank all my classmates, the administrative staff in Vatel in Mauritius, the professional instructors as well as the professors and lecturers that I was lucky enough to meet while I attended Vatel. And very special thanks to the entire Ritz-Carlton Dubai team who allowed me to begin my career.